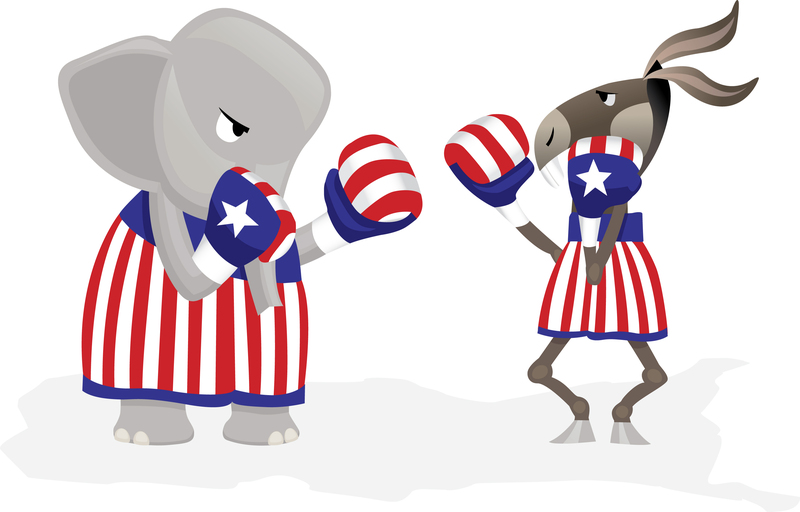 It is a persistent belief among many in the political and media establishments that the United States is a “center-right nation” which finds progressives to be far too liberal for mainstream positions of power. If you look purely at electoral outcomes, those who assert this appear to have a fairly strong point. The last several decades of federal politics have been dominated by center-right policies and truly left wing politicians have been largely marginalized (ex. Bernie Sanders). Even Clinton and Obama—the last two Democratic presidents who, theoretically, should be leftists—are corporate-friendly moderates who have triangulated during negotiations with Republicans to pass center-right policy compromises (ex. Obama’s Heritage Foundation inspired ACA or the Clinton Defense of Marriage Act compromise). While electoral results support the idea of a center-right USA, looking beyond electoral politics—which involve a mixture of policy choices, party politics, fundraising, and propaganda—and focusing purely upon raw policy preferences, leaves us with an entirely different picture. Here is a compilation of polling data from various reputable American polling organizations, describing the policy preferences of the Americans people over the last year. According to Gallup polling, 59% of Americans think that the US distribution of wealth “should be more evenly distributed” among a larger percentage of the people while only 33% thought that the current “distribution is fair.” While this is down from the 2008 modern high point, where 68% of Americans supported more redistribution, the public opinion of redistribution has held a stable majority, if not super-majority, for decades. The fact that such a large number of Americans believe that the distribution of wealth is currently too skewed towards the wealthy, is made far more relevant by the fact that they don’t actually know just how skewed the wealth distribution has become. 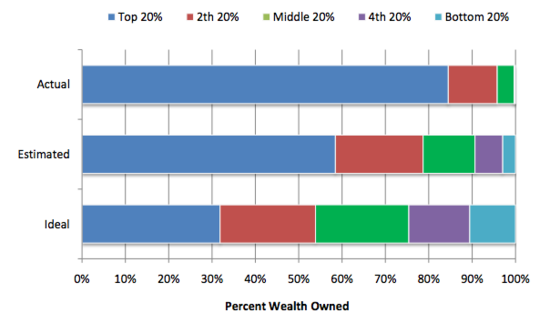 As explained by Michael Norton of the Harvard Business School, Americans think that the current distribution of wealth is far more equal (middle bar graph) than it actually is (top bar graph)—in short, they recognize the problem, but lack an understanding as to just how bad it has become. 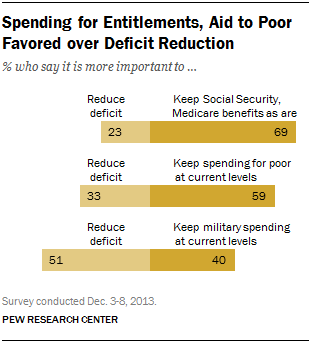 According to Pew Research, 69% of Americans oppose any cuts to Social Security or Medicare, even in order to cut the deficit, while only 23% support such cuts. Additionally, 59% oppose cuts on programs assisting the poor in order to address the deficit, while only 33% support such austerity. A multitude of polls have indicated that between 60% and 80% of Americans support increasing taxes on the wealthy, depending upon how the question is worded and the polling venue—this indicates that a majority of Americans support increasing taxes on top-earners in order to reduce the deficit. According to Quinnipiac Polling, 71% of Americans support increasing the minimum wage to at least $10.10 an hour, while only 27% oppose increasing the minimum wage. According to Gallup Polling, 54% of Americans support labor unions, while only 39% disapprove of unions. 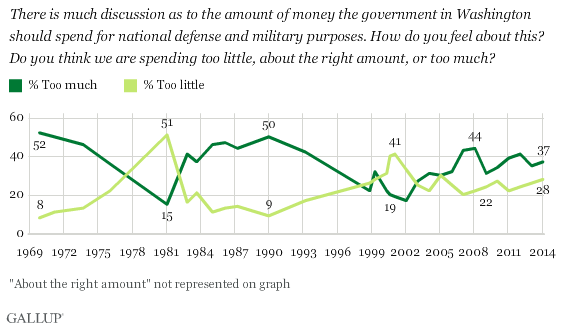 According to Gallup Polling, 37% of Americans think that we spend too much on defense, while only 28% think that we spend too little. During the fight over letting jobless benefits expire, Quinnipiac Polling found that 58% of Americans supported extending benefits by at least 3 months, while only 37% of Americans supported letting benefits expire. 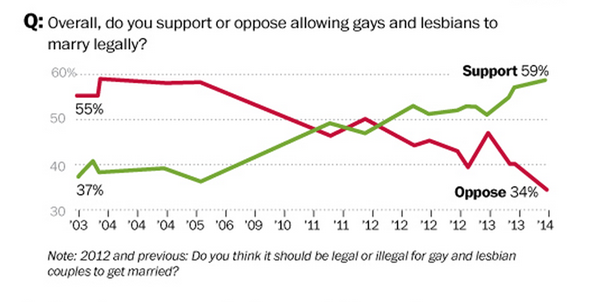 According to Washington Post/ABC polling, 59% of Americans support gay marriage, while only 34% oppose marriage equality. According to Pew Research, 54% of Americans support keeping abortion “legal in all/most cases,” while only 40% support making abortion “illegal in all/most cases.” While informative of public opinion, this poll is moot, as abortion is a constitutionally protected right, and there is no way for even a majority of anti-abortion voters (that hasn’t existed for decades) to legally make abortion illegal in most cases. According to ABC/Washington Post polling, 51% of Americans disagree with the Supreme Court’s decision to strike down Section 5 of the Voting Rights Act, while only 33% support the decision. This decision was a direct result of the AL GOP’s attempts to circumvent the Voting Rights Act preclearance provision, and was engineered to allow right wing legislatures to pass voter disenfranchisement laws. According to polling by the Feldman Group, 62% of Americans support the Paycheck Fairness Act—which seeks to close the gender-based wage gap—while only 29% of Americans oppose the act. 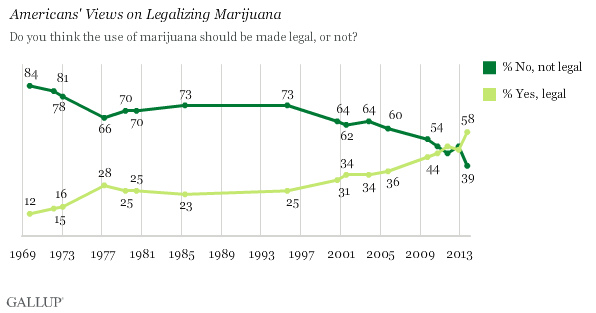 According to Gallup Polling, 58% of Americans support legalizing marijuana, while only 39% support continued criminalization. Even Fox News Polls indicate that 68% of Americans support a pathway to citizenship, while only 15% support deportation—of the remaining 17% of those polled, 13% support expanding guest worker programs while 4% didn’t know what they wanted. 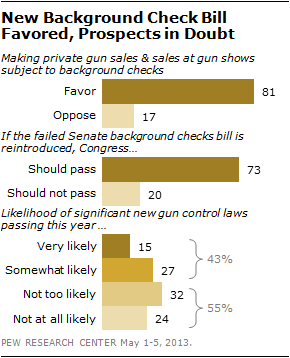 According to Pew Research, 81% of Americans support universal background checks for all gun purchases, while only 17% oppose them. A UC Davis poll concluded that even 55.4% of gun sellers supported universal background checks and disqualifying offenses for gun purchase, while only 37.5% opposed background checks. 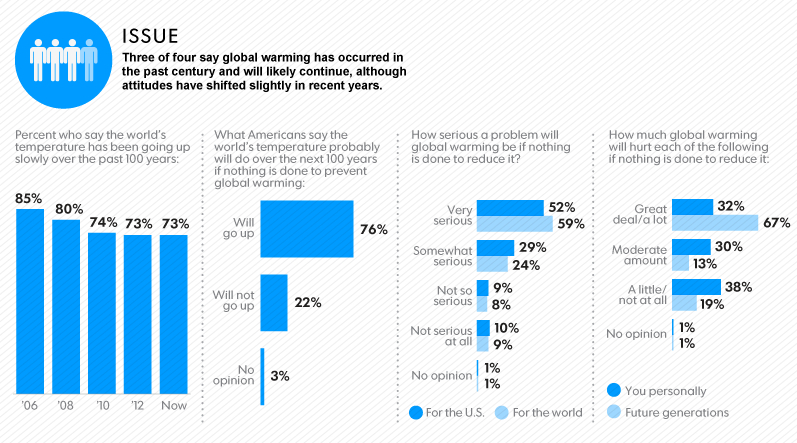 According to USA Today/Stanford University polling, 73% of Americans believe in climate change and 52% of Americans say that it will be a “very serious” problem if we don’t implement policies to reduce it (as opposed to 10% who say that climate change will be “not serious at all”). According to polling by Perception Insight/Greenberg Quinlan, 66% of Americans support stronger EPA air regulations, 72% support stronger carbon-emission regulations, and 60% support stronger regulations on motor vehicle emissions. According to these policy polls, an “average American” supports the redistribution of wealth through taxing the wealthy more, wants to increase the minimum wage and environmental protections, thinks that unions are beneficial to society, and opposes attempts to cut anti-poverty programs or entitlements, even if those cuts are intended to balance the budget. On social issues, this theoretical American supports gay equality, reasonable abortion access, universal background checks for gun purchases, wage-equality for women and the legalization of marijuana. In short, this “average American” holds views which line up almost exactly with a center-left political ticket, similar to what many European social democratic parties have run on. It is certainly true that this description of the average doesn’t take into account regional variations (ex. 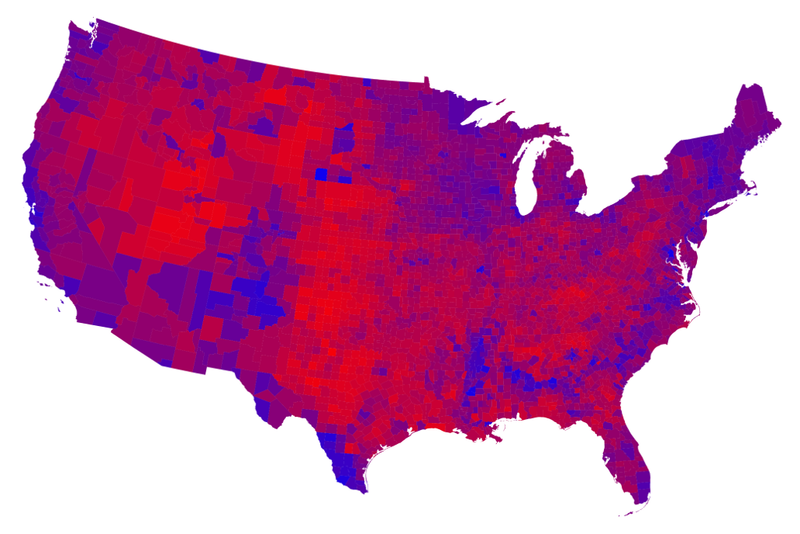 the south likely holds many extremely conservative Americans whose preferences are simply cancelled out in these national poll by the more populous coastal cities), but this is an accurate description of the aggregate opinion of the entire population of the United States. While Americans tend to align with the left or center-left in terms of policy, a disproportionate number still vote for Republicans or self-identify as conservatives. These people are voting based upon their perception of the parties (ex. Voters can grow up “conservative” or “liberal” and will reflexively vote for a person who identifies themselves as part of that “tribe” over others) or other non-policy criteria. They are using heuristics and socialized cues (ex. religion) to decide who to vote for, rather than an objective assessment of which candidate better supports their policies. The tendency of the American public to vote based upon party or cultural identification rather than objective policy preferences creates a situation where almost half of our political representation in the federal government supports policies which are supported by only a tiny minority of the total population—this is what has led Congress to have a 13% approval rating, up slightly from when it cratered to 9% in late 2013. If the American people want to actually implement their policy preferences, they need to stop voting based upon cultural or party identifiers and start voting based purely upon policy—Democrats need to vote for progressive politicians while Republicans need to vote for conservatives who do not live far out on the fringe that they fall of the edge of sanity. As you always do, so very well done.